"An easy vegetarian lasagna with ricotta, mozzarella and Parmesan." Preheat oven to 350 degrees F (175 degrees C). Bring a large pot of lightly salted water to a boil. Add pasta and cook for 8 to 10 minutes or until al dente; drain and lay lasagna flat on foil to cool. In a medium bowl, combine ricotta, Parmesan, eggs, salt and pepper; mix well. In a medium saucepan, heat oil over medium heat and saute garlic for 2 minutes; stir in spaghetti sauce and Italian seasoning. Heat sauce until warmed through, stirring occasionally, 2 to 5 minutes. Spread 1/2 cup of sauce in the bottom of a 9x13 baking dish. Cover with a layer of noodles. Spread half the ricotta mixture over noodles; top with another noodle layer. Pour 1 1/2 cups of sauce over noodles, and spread the remaining ricotta over the sauce. Top with remaining noodles and sauce and sprinkle mozzarella over all. Cover with greased foil. Bake 45 minutes, or until cheese is bubbly and top is golden. Way too much cheese. Way too much egg. Not nearly enough sauce. My family loved this recipe, I made my own sauce and put in about 42 oz of sauce insted of the 32 oz so that it was not dry. Will make again!! If you love cheese and lasagna but not the meat, than this is the recipe to use! My kids absolutely loved this and it was easy and can be saved and reheated and still have that great taste!! I made this for a potluck and everyone loved it. I substituted cottage cheese and added a little bit of red pepper flakes. Sauteing the garlic in olive oil to flavor jarred sauce is brilliant! What a great tip to incorporate into other dishes. 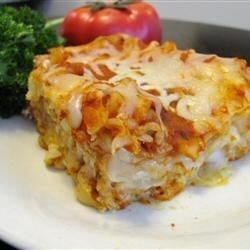 This recipe made a great tasting lasagna. This was my first time making lasagna and it couldn't have been easier! I added some chopped broccoli and it was delicious!